To measure the distance of an object a distance away, you will need a distance sensor. The following presents a list of range distance sensors to measure longer range with more precision. These sensors can be interfaced with an electronic controller which you can take the reading and use the information for automation control. Laser distance sensor can measure distance up 40 meters with accuracy +/- 0.025m. 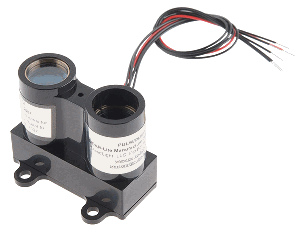 The ultrasonic sensor uses sound as a medium to detect the distance to a distanced object. A sound is transmitted and the time it takes for the reflected sound to return helps determine the distance of an object. The sensor has to transmit and receive the sound, therefore no object like glass should be placed in front of the sensor. Suitable for measure distance from a few cm to a few metres. Interface: RS232 (9600bps), Analog output (0.4mV/mm), PWM output (5.8usec/mm). Check out our other types of electronic sensors for your project installation use.